Tulku Migmar Tsering is a master of the Chokling New Treasures lineage of the Nyingma tradition of Tibetan Buddhism. He was born in Nubri, Nepal in 1975 and began his training at an early age after having been recognized as a reincarnate lama. Tulku Migmar began his formal education in 1983 at Ka-Nying Shedrub Ling Monastery in Kathmandu. Through the years, Tulku Migmar proved to be an outstanding practitioner, mastering all of the elaborate vajrayana rituals and sacred arts so essential to the Chokling New Treasures tradition. Tulku-la completed a 3-year retreat under the close guidance of his root guru, the renowned Dzogchen master, Kyabje Tulku Urgyen Rinpoche . 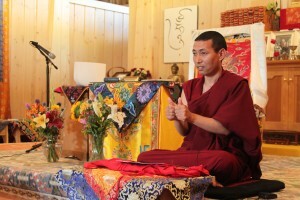 He has received extensive teachings and empowerments from Kyabje Tsikey Chokling Rinpoche, Kyabje Chokyi Nyima Rinpoche and Kyabgön Phakchok Rinpoche. He then went on to study for six years in the Ka-Nying Shedrub Ling ‘ Shedra or Monastic College. There he excelled at the intricacies of Buddhist philosophy in the monastery’s advanced Buddhist studies program. Tulku-la has also been an integral part of humanitarian and cultural preservation activities within Nepal. Tulku Migmar has been a friend of Kyabgön Phakchok Rinpoche since childhood and they share a close dharma bond. Tulku-la continues to work hard to develop his English language skills so that he can share the dharma in a way that allows his audience to truly understand and gain experience. For the past five years, Tulku Migmar has been based in Singapore, where he has fulfilled multiple roles of lama, spiritual advisor, ritual specialist, counselor, organizer, cook, and center manager. In addition, he has traveled throughout Asia and North America teaching and inspiring students at many centers. Tulku-la is a keen observer and is quick to understand the difficulties faced by students from many nationalities and walks of life. Phakchok Rinpoche has appointed him the senior lama and supporting teacher for his sangha based upon his wonderful qualities as a lama and his strong capacity and desire to help others.